Why do fish cost so much? Ever winced at the price of a fish in your local aquatic shop and wondered why it was so expensive? It's a subject that often gets raised, says Nathan Hill. Actually, my opening title is a bit of a bluff. I’m not sure that fish do cost much, at least not for what we’re getting. But given how the price of fish has come up many times in conversation now, and given that nobody has ever really sat down to explain some of the intricacies of it, I think a blog on the subject is overdue. Some people feel put out paying for a fish. I know this because of the overwhelming number of times I was asked 'can you do it any cheaper?' whilst I was in retail. What really grated was that often the fish in question were already on the lowest mark ups, with myself not making anything that could be considered an unfair profit on them. That said, there are some prices I see on my many tours that make me wince. I’ll look at desirable catfish and imagine the alarms that I’d set off in my bank if I were foolish enough to try to purchase. I see marines that would require me to spend months living on nothing but toast to justify. There are indeed some expensive fish out there. Why is that? After all, they just get yanked out of rivers and that, don’t they? Bodies of water don’t charge variable rates for fish, surely? Well, sort of, actually. A lot of fish buyers are blissfully unaware of the trade, and the inner workings of retailing fish. The fish we buy in stores don’t appear from some bottomless reproductive tank hidden out back of the shop. There are no resident banks of battery Guppies, or roaming pools of free range Oscars that the retailer can plunge his or her net into, trawling up livestock like chips out of a deep fat fryer. No, the fish we buy have a lot of airmiles. A single Neon tetra is often better travelled, and has seen more bureaucratic paperwork in one journey than I’ve managed in my whole life. Whether you’re buying wild caught or farmed, those fish will be foreign, from faraway hot places where I’d rather be residing myself. Unless you like temperate fish, in which case they’ll be coming from areas I’m not so fussed about. Along the way, they’ll usually pass through several hands, and a few different tanks. Each and every step along the way adds a little more until the price eventually creeps up to something that is very far removed from the few pennies that original farmer or collector was offered for them. Mark ups are clearly the killer, especially the final mark up by retailers. Having come from the trade, I know what most of these mark ups are, but I’m not about to blow some kind of whistle. If you’re here for some shameless expose, then you’ve come to the wrong blog. I appreciate that fish need to be marked up to make money. A lot of smaller fish, the fish we often refer to in an almost derogatory way as the bread and butter fish, have the greatest mark ups of all. This is entirely fair, in part given that they’re the mainstay of the trade and keeping the store afloat without being duly unfair on the buyer, and also from the point of view that making them too cheap makes them an expendable commodity. Expendable commodities are something I would never like to see happen with livestock. There are already too many ‘throwaway’ fishkeepers for my liking, and if we have to pay a few pennies more on our fish to reduce that, then I for one am happy to pay. The mark up itself is there to cover many, many things. Livestock sales aren’t out and out profit for the retailer. A shop doesn’t take the £50 you spend on fish, and rush out to get a top hat and browse the Maserati showroom while eating caviar. No, the business costs will gobble a lot of that straight away. Those fish on sale need feeding. A retailer could opt to use the cheapest, most nutritionally devoid flake foods in the world, but such a retailer wouldn’t (and generally doesn’t) last long. Thin fish aren’t a desirable purchase, and fish with weak immune systems have a nasty habit of coming back dead, with disgruntled owners demanding refunds. It’s bad business sense to cheap out on livestock care. So, many (though not all, it is a shame to say) retailers use quality food for their fish. Bulk buying helps keep the prices down, for sure, but even so, when you’re racing through slab after slab of frozen food daily, that’s all money that needs to be recuperated somewhere down the line. Electricity is a big shock in retail too. I get shouted at for leaving the lights on in the bathroom. Imagine the costs of having thousands upon thousands of watts of lighting burning away all day every day. No wonder so many shops are trying to embrace LEDs these days. 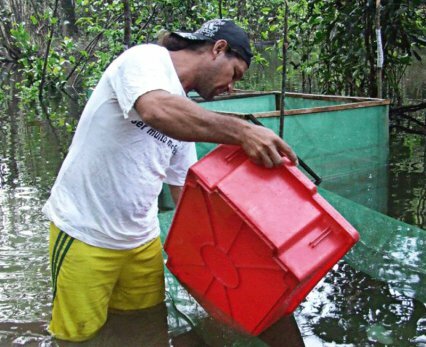 Remember too, that many fish will be sat for weeks out back in a quarantine system. In this state, they’re guzzling money, and for no return. If they do get ill, and need treating, then that’s more expense, and more time that they can’t be sold. Livestock retail can be pretty unforgiving. The pumps, UV’s, and all other trappings of running hundreds of tanks all come along for the ride. You might have seen your fuel bills skyrocketing after adding a big marine system in the house. Multiply that a few hundred times and you have an aquatic store. Then there are the other aspects you tend not to see. Wages are one. Nobody likes working for free, and it’s too hard to try to train domestic animals to do the roles, so employees have to be found. People with homes, and lives, and a requirement for cash. But a big stinger is also the dead-on-arrival fish. There, I’ve said it, and it’s out in the open. Sometimes fish die in transit. And what’s worse for the retailer is you might well be unable to get your money back on those cadavers. A lot of suppliers offer no 'dead on arrival' policies for live fish. If it arrives dead, it arrives dead. Order two boxes of guppies, say, and one of them turns up dead, then the other box needs to make twice the amount when it sells to make up for the loss. It’s amazing how quickly these things spiral. And that’s how a lot of fish come in - boxed. This in itself explains a lot about pricing, as boxes needs to be transported and delivered. Freight for what is basically a box of water with fish in is not cheap, especially as these things are done by weight. If airlines are charging by the kilo, that fifteen kilo box can get awfully expensive. Freight has skyrocketed in accordance with global trends. Fuel has increased, security has increased, labour on keeping flights running has increased. And despite all of this, I can still find neons on sale today for the same price I did ten years ago. I guess we’re not doing so bad, huh? How much you can get in a box has an effect, as there’s only limited space. If I have a box with a thousand small fish in it, then the cost of the freight on that box can be divided up by a thousand and added to the eventual price of each fish. But if I’ve got three or four bigger fish in a box, I might have to reclaim a good £25 or more on each in freight and transport costs alone – before I’ve even accounted for the price of the fish. See how it can start to add up? And of course, there’s the initial price the retailer is paying for their fish. If they’re taking the chance on directly importing, then they can cut out a couple of wholesaler links along the way. But then, of course, they run that enormous risk of dead fish that they can never get refunded. Exchange rates have their role to play. For those who don’t know already, the strength of the pound is not constant. What a pound is worth abroad fluctuates from month to month. I recall happy times, when fish from the Far East carried amazing value, when exchange rates were between two and a half and three Singaporian dollars to the pound. Now, there are less than $1.9 Sing to the pound. What affects the initial price of the fish, the price that a retailer will see on a list before any other costs are factored in, is scarcity and desirability. A catfish from some obscure stream that cannot be accessed for three quarters of the year, and requires a month long expedition to collect and bring back will understandably cost more than a fish that can be dredged out of a pool right by the exporter’s house. Rarity is an expensive luxury to pay for, and even in the form of farmed species, you can expect to pay considerably more. It doesn’t have to just be wild rarities that are desired, either. Farmed morphs and unique colour strains can all command a high price, even if the irony of the situation is that many such fish would actually be considered 'runts' in the wild. In these cases, value can be subject to a boom and bust culture. When Albino tiger Oscars first came out, they were hundreds of pounds a head, because there weren’t many of them. Now every farmer and his pig is breeding them, they often appear on offer, to try and get some through the system. So have prices altered much in the last decade? Well, not really no, not compared to things like chocolate bars, anyway. For the mainstream stuff, prices have been rather constant. I can still pick up the staples – angelfish, guppies, platies, tiger barbs, bronze corydoras – for around the same prices I’ve always paid for them. Yes, there’s variation, some places pushing out a basic fish for 75p, others at £1.25 or more, but there always appears to be a tight bracket in which the fish hovers. On the other hand, the one-offs and oddities are all over the show. 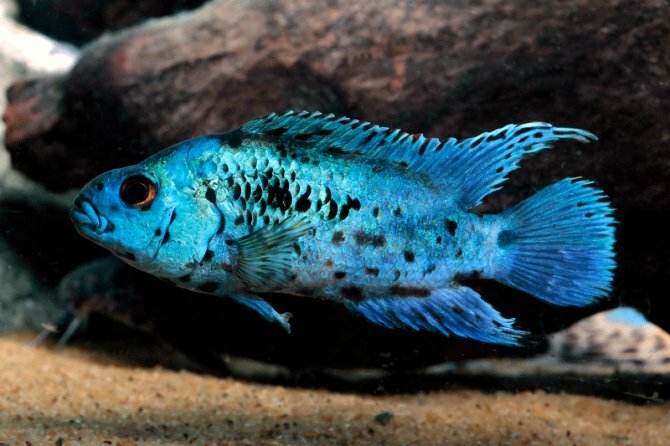 We’ve seen electric blue Jack Dempsey cichlids for the £7.50 mark in Manchester region, where the same sized fish in London was over £30. The discrepancy here is a little harder to fathom. Direct import vs. wholesale purchases may account for some of that, and certainly some European wholesalers do seem to have a high price on stock. Even so, I can’t help but to think that there are occasional instances of arbitrary pricing up taking place in some stores. In fact, as much as I hate to say it, I’ve noted a definite north/south divide when it comes to pricing. I’m not going to dwell on it, but do wonder if you’ve noticed the same? Ironically, for all of my doom and gloom soothsaying regarding fish, if a store does it right, then it can make good money. Many do, in fact, and there’s a good reason that some of the newer stores are spending more and more time focusing on a good range of fish than they do on dry goods. If I had to be cutting, I’d predict that dry goods in retailers are now close to being a dead duck, which is a tragedy. The online phenomenon and culture of internet buying has dropped the value of tanks, cabinets and hardware to an all time low. If I got back into the trade now, I’d laugh at a sales rep trying to sell me new lines of expensive gear. The internet is winning, to a great loss within the hobby. But that’s marketplace evolution for you. So there you have it. Hopefully a little insight into where your money is going when you pick up your six platies this weekend. Of course, there are more areas we could explore, and some of the subtleties of what can add a few sheckles on to a mark up here and there are fascinating, but for now I risk becoming bogged down in way too many details. And ultimately, a couple of quid for a living organism really isn’t that harsh a price to pay, is it? There’s some truth to the old line that life is cheap. Cheaper than you’d expect, all things considered.